a chemical element, atomic number 56, atomic weight 137.34. (See Appendix 6.) Ingestion of excessive amounts can be toxic, occasionally resulting in fatal hypokalemia and paralysis. barium sulfate a water-insoluble salt used as an opaque contrast medium for x-ray examination of the digestive tract. barium test x-ray examination using a barium mixture to help locate disorders in the esophagus, stomach, duodenum, and small and large intestines. Such conditions as peptic ulcer, benign or malignant tumors, colitis, or enlargement of organs that might be causing pressure on the stomach may be readily identified with the use of barium tests. 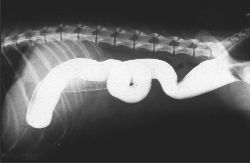 If perforation exists or is suspected, the barium test should not be administered. It is important to evacuate the barium completely following the study; a mild laxative is usually prescribed for this purpose. Barium sulfate is a harmless chalky, water-insoluble compound that does not permit x-rays to pass through it. Taken before or during an examination, it causes the intestinal tract to stand out in silhouette when viewed through a fluoroscope or seen on an x-ray film. Two main types of tests are conducted with the use of barium: the barium meal or barium swallow, for radiologic examination of the upper gastrointestinal tract, and the barium enema for examination of the lower gastrointestinal tract. Barium test: Barium meal and follow-through. Normal stomach and small bowel. From Aspinall and Taylor-Robinson, 2001. A metallic, alkaline, divalent earth element; atomic no. 56, atomic wt. 137.327. Its insoluble salts are often used in radiology as contrast media. /bar·ium/ (Ba) (bar´e-um) a chemical element, at. no. 56. Its acid-soluble salts are poisonous; causing gastrointestinal symptoms followed by severe, sometimes fatal hypokalemia with paralysis. barium sulfate a water-insoluble salt, BaSO4, used as an opaque contrast medium in radiography of the digestive tract. 1. Symbol Ba A soft, silvery-white or yellowish-white alkaline-earth metal, used to deoxidize copper and to absorb trace gases in vacuum tubes, and used in various alloys. Atomic number 56; atomic weight 137.33; melting point 727°C; boiling point 1,897°C; specific gravity 3.62; valence 2. See Periodic Table. 2. 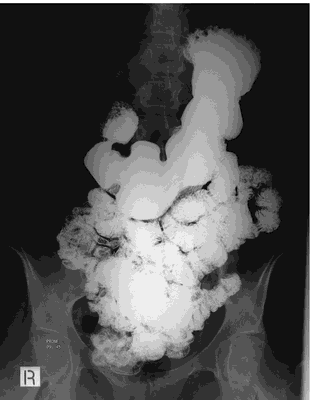 A radiopaque solution containing barium sulfate that is used to visualize the gastrointestinal tract on x-rays. a pale yellow, metallic element classified with the alkaline earths. Its atomic number is 56; its atomic mass is 137.36. The acid-soluble salts of barium are poisonous. Barium carbonate, formerly used in medicine, is now used to prepare the cardiac stimulant barium chloride; fine, milky barium sulfate is used as a contrast medium in radiographic imaging of the digestive tract. A silver-white alkaline earth-metallic element—atomic number 56, atomic weight 137.3—which melts at 727ºC. Pure barium does not exist in nature as it is oxidised, often as baryta. Barium is the core constituent in non-radioactive radiocontrast studies (e.g., barium enema, barium swallow), and formulated as a chalky liquid, popularly, a milkshake. A metallic, alkaline, divalent earth element; atomic no. 56, atomic wt. 137.327. Salts are often used in diagnostic x-rays. A chemical used in certain radiological studies to enhance visualization of anatomical structures. A metallic, alkaline, divalent earth element. Its insoluble salts are often used in radiology. n a pale yellow, metallic element classified with the alkaline earths. n a white, finely ground, tasteless powder that is insoluble in water, solvents, and solutions of acids and alkalis; used in radiography as a contrast medium because of its opacity to roentgen rays and as a protective barrier in plaster walls.